What if acclaimed American chef Charlie Palmer opened up a burger joint? You'd get DG Burger in Costa Mesa. According to the signage, DG stood for "Damn Good." When an establishment declares their burger to be damn good, we are obliged to see if that claim holds up. Happy Meal and I headed down to the South Coast Plaza in Orange County to investigate. Chef Palmer and crew had already had a month to work out the kinks, so we hoped for a smooth service. It certainly smelled of tasty burgers as we approached the Bloomingdale's entrance of the mall. We were the only customers at the DG Burger space when we arrived at noon, so we encountered no waiting time. We ordered the DG Burger, $7.95, with aged Cheddar, $2.00 extra, cripes. $9.95 for a cheeseburger--we passed on the $5.00 fries, since a tiny bottle of Diet Coke was already $3.00, and a chocolate malt (it tasted heavily of molasses) was $5.00--it was a cloying and unpleasant version of a milkshake. Still, this was one of Charlie Palmer's self-proclaimed Damn Good Burgers. After a brief wait, our food arrived from the kitchen. The attendant at the ordering kiosk (not kidding) was kind enough to let us have the accompanying vegetables and sauce on the side--well, that's what I requested, twice. What happened is that none of that stuff ever showed up...Weak! I also had to ask her twice about the beef blend in the patties. She didn't seems to care enough to remember...keep in mind that this is Charlie Palmer's signature burger venue. We ordered the chicken skewers, too, but Happy Meal found them repulsive. They whisked them away from the table but failed to suggest/provide an alternative or offer a refund, so I just threw that 8 bucks away. Weak. It was reasonably flavorful. It did lack a beefy punch, though. There was not taste of aging that one might expect from the non-Chuck elements. It was not overly greasy. It was almost juicy enough. The cooked mine pretty hard--maybe Med-Rare would have been better. The beef was toothsome without being chewy, and the gristle from the Chuck was minimal. The Sear: The sear was hefty, dark, and crunchy. There was a certain amount of char, which was pleasant on the first few bites, but over time that wore thin, and had me wondering why Charlie Palmer dinged me 10 bucks for a small backyard burger. The Seasoning: The seasoned the exterior, and the blend was not seasoned. This was fine. The patty was small and thin enough not to require seasoning throughout. Still, it was lacking in umami flavors. The Preparation: The small patty was medium in thickness--about 1/2 inch. 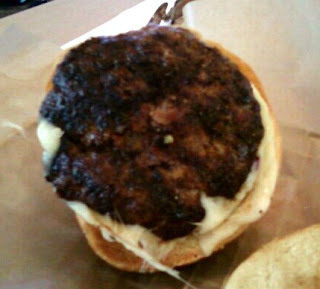 The blend was formed into patties with gentle pressure, so the bite was firm without being chewy. Sadly, it was cooked too hard--Medium/Medium-Well. The puck of beef was cooked on a mighty hot gas grill. The Cheese: It sure didn't taste like 2 bucks. It was merely fine. 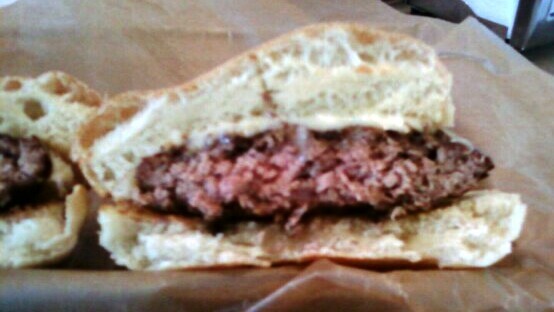 It was a competent medium sharp, white Cheddar, which didn't really stand up to the chewy bun. It did, however, lend some creaminess to bite. The Bun: This was a toasted, Semolina/Potato bun. It was mild, dense, and satisfyingly chewy. The bun was fine and it stood up to the firmness of burger. This came from a local bakery. The Meat to Bun Ratio: This was dead on. The Value: The DG Burger was a lousy value.10 bucks for a small burger, no fries, and an extra 3 bucks for a mini bottle of soda was way too much. A bigger, better, and less expensive burger can be found at Umami Burger. the chocolate malt was not good. Also, DG Burger was in a mall. I suppose they must have been banking on having enough mall traffic that they would not need repeat business to sustain them. I didn't mind shelling out some dough at Charlie Palmer's at the Four Seasons in Las Vegas, but the portions were not miserly there, either. Happy Meal and I walked away from DG Burger hungry and feeling a little ripped off. We were both ready for lunch after blowing 32 bucks (with tip) at DG Burger. That notwithstanding, we don't really rate on the value--we rate on the burger alone, and it was pretty good. 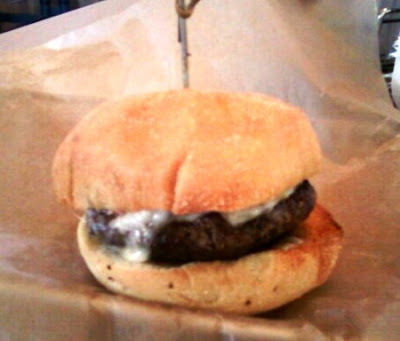 Burger Review : Damn Good Burger was hyperbole for "Way Over-Priced, Dinky, Better Than Average But Not Great Burger." I walked in a fan, and I walked out a skeptic. Rating...2 Bites....Service and Value were so bad that we factored them in. The flavor was better than average, but the burger was over-cooked and charred. We do not, by any stretch of the imagination, suggest that anyone go to DG Burger.